Kenyan national; Joel Kioko, who was brought up in a Nairobi Slum is waiting in earnest for news on his ballet future. Joel’s home was a shack situated in one of nine neighbouring slums that comprise Africa’s largest urban informal settlement. The diseases associated with extreme poverty are rife in the slums outside Nairobi’s city centre. The Kioko family residence is actually a replacement of one recently destroyed by the common occurrence of fire. These are Joel’s origins. Waiting in earnest; this humble emotion confirms Joel’s mindset after several conversations with the sharers and givers who know him personally. These individuals relocated to Kenya with the intention of nurturing Nairobi communities with hope and nourishment. Between them a series of charities and educational projects are organised; Lunchbowl Network, Anno’s Africa and Artists for Africa to mention a few. They heartily describe the dignified and gracious manner of the recipients to their contributions. So often the victims of poverty they encounter accept their situation and expect little. A future in ballet; ballet was unknown to Joel just four years ago. Now at age seventeen his natural affinities of agility, strength, discipline and form have been recognised with two full scholarships, awarded by two leading ballet institutes; the Royal Ballet School and the English National Ballet. Who would have thought such an astonishing accomplishment was possible in such a short period of time? What were the chances that this young man’s gift would be realised from amidst the one hundred and seventy thousand to two million inhabitants? There is no question that the unlikely opportunities are solely attributable to Joel’s natural talent. He has magnetically attracted the supportive reactions of his neighbours whether in the form of ballet training, care and nutrition or in the transportation to England for his RAD auditions last April. 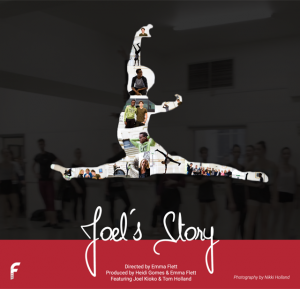 “Arts lift people to new places” is the key message in a seven minute screenplay of Joel’s Story starring Joel and Tom Holland comparing their experiences in the universal language of dance; filmed and produced by Emma Flett and Heidi Gomes. The film presents part one of this epic journey and was created in the hope of generating donations for Joel’s tuition and lodgings in London. 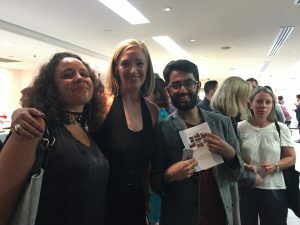 Heidi and Emma invite their audiences to contribute towards making talented dancers like Joel a reality and to join them in being a part of the story. Our hopes are with Joel overcoming the barriers of poverty to secure a place in the future he deserves. Joel’s Story continues to attract much interest as all watch in hope of dreams being realised, especially when born in unexpected places. A story to be followed and that indisputably warrants a sequel.